Now with AAAHeadsets FREE shipping (SAVES you a further $15). No more rushing back to your desk to answer calls. The Plantronics APP-51 Electronic Hook Switch (EHS) module for Polycom enables wireless headset users to place or receive calls without the need to lift your handset. This eliminates the need for a mechanical device such as the Plantronics HL10 Savi handset lifter. When a call is received, you will hear a tone in your ear. Simply press the talk button to answer the call. Press again to hang up. The APP-51 Polycom EHS supports the SoundPoint IP 320*, 321*, 330*, 331*, 335, 430, 450, 550, 560, 650, and 670 model phones. The Plantronics Polycom EHS only works with the following Plantronics wireless headsets: CS510, CS520, CS530, CS540, all Savi 700 series, Savi WO300 & Savi WO350. Use the APP-5 for earlier model headsets. Always be aware of incoming calls, even when away from your desk, with the headset ring alert. Freedom to move around the office and accept and end calls from wherever you are with your wireless headset call control button. Direct connection to your Polycom SoundPoint IP phone, which eliminates the need for a mechanical handset lifter device. *The 320, 321, 330 and 331 require a 2.5mm to RJ-9 adapter, which is available from AAAHeadsets. 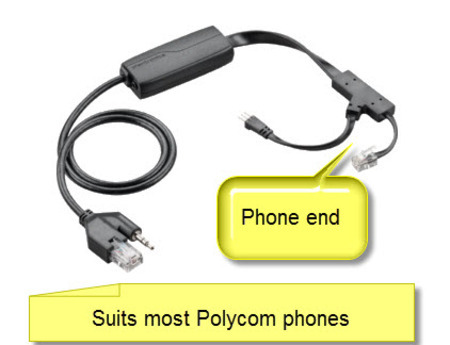 To activate your Polycom phone to work with this EHS cable you need to read Polycom's Technical Bulletin 35150 "Using an Electronic Hookswitch (EHS) with Polycom SoundPoint IP and VVX 1500 Phones"